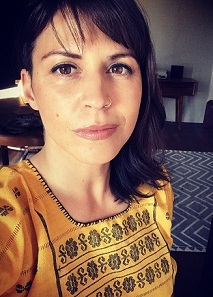 “Natalie A. Martínez is a poet and scholar of rhetorical studies. She received her BA in Literature from Westminster College-Salt Lake City, Utah, an MA in English Studies from Western Washington University, and her PhD in Rhetoric, Composition, and Linguistics from Arizona State University. She began teaching college composition and rhetoric in 2002. In 2008 she was a CCCCs Scholar for the Dream Award Recipient, for emerging scholars from historically underrepresented groups. In 2009 she was selected to be one of the RSA Queering Rhetorical Studies Workshop Participants at Penn State University. Her research and writing has focused on the rhetoric of anger and melancholia among queer Latinx writers and activists and the productive ways those emotions have been mobilized. She has taught and written in a variety of contexts: in a women’s prison, on the floor of the Florida State Senate as a bill editor, an after-school tutoring center for youth, and a community based writing course serving refugees and immigrants in Arizona. Her poetry and non-fiction has been published in Ellipsis, Nepantla: A Journal of Queer Poets of Color, and art zine, La Norda Specialo, among others. She served for two years as one of the advisors to the LGBTQIA Resource Center on campus, and is still a member of the LGBTQIA Task Force. She is a member of The Alice Gallery curatorial collective (with Julia Freeman, Dan Paz, Thea Quiray Tagle, Bettina Judd, Julia Heineccius) where she organizes the Writers in Residence program.